It's raining outside. That really gentle kind of rain when it's so pleasant to wrap up in a favorite coat and drink something warm. 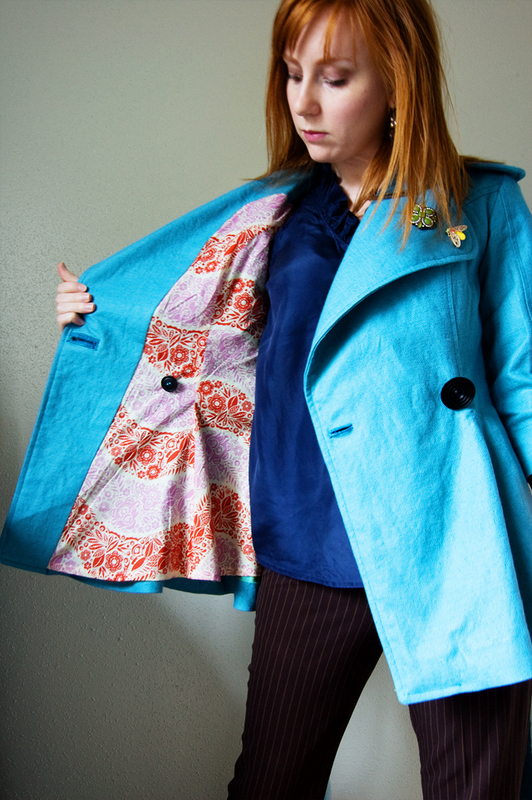 I was a tester for the Lady Grey Coat for Colette Patterns this last time around. I started with a muslin to look at fitting adjustments, my typical routine. I've ruined so much fabric by not getting the fit right the first time. After I'd finished the muslin, I put the pattern and the muslin away thinking that later I would make the coat out of something brilliant and fabulous. This last New Year's one of my resolutions was to finish all unfinished sewing projects and I felt that this fell into that category. The instructions were easy to follow. Making the instructions good seems to be a theme for this company. The Lady Grey Coat is labeled advanced, but the instructions do provide a pretty good amount of hand holding for an advanced beginner. They are concise and easy to understand. 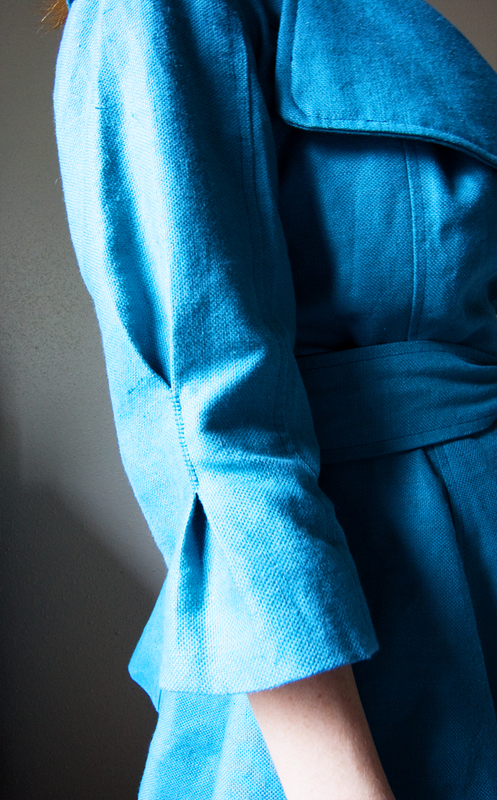 I made this coat from a cotton fabric which much resembles the weave and texture of burlap. It's really heavy and I was actually, going to interline it but in the end decided not to.The coat would have been way too heavy if I had. I lined the coat in Anna Maria Horner's Little Folks Voile and it is so soft to the touch and feels perfect against my skin. However, the voile isn't as slippery as a traditional lining and so for a garment like this, I probably wouldn't do that again. I sewed this pattern up in my size according to the size chart and would recommend that if you are going to actually wear this number as a coat that you sew it up in a size larger. This way you have a little extra room for heavier tops that could go underneath. Mine is a little snug in the upper back. 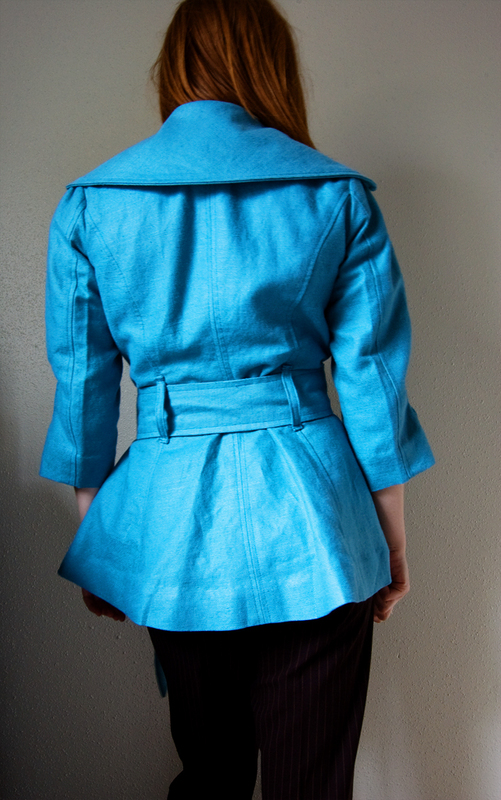 I topstitched the coat in a contrasting turquoise thread. The lapels aren't the prettiest, but oh well! so much learned for the next time. When I mocked this up in muslin the sleeve was too large for the armhole. I ended up just gathering the sleeve into the armhole in the final, which gave me a little more room in the upper back. You can barely even see it because of the collar but there you have it. The sleeves in general were a little large-ish and I have fairly thin arms (but a very strapping broad shoulder line, go figure) so I gave the sleeve a pleat at the elbow and topstitched it by hand. Overall, I like this coat. It's a great color and that kind of works with a lot of other pieces in my wardrobe. It's a good weight, nice shape. Don't think I would sew it again, but maybe with several edits. Lovely -- and beautifully photographed. A+ on the gloves! Love your coat! Hehehe... I bought this pattern as soon as I saw it on her website, and I had my local shop order it so I could buy it. :) I was a little intimidated by the "advanced" labeling, but thanks for the review! I really want to make it in the winter white coating... just need to find the right fabric! Oh, I adore it! If you don't mind, I'd love to post it on the CP blog and add it to the gallery! Gorgeous! 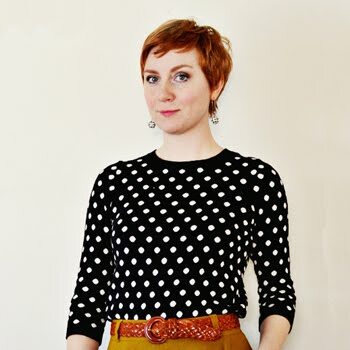 Congrats for being featured on BurdaStyle! Oh I want one of those! What a beautiful coat! Beautiful! That lining fabric is a really lovely contrast. I'm definitely going to check out that pattern. Oh, it's lovely! So flattering and feminine. Well done! wowza! love your style and work. so inspirational. What a gorgeous coat. Everything is so classy, the shape, the color. Bravo! I am definite that this would flatter my wife. I also like the long tie around the waist, very beautiful. I have been looking for this coat everywhere! Well, I didn't know about it until I saw your blog, but it's the style I've been daydreaming of. I'll have to stash the pattern away until I'm a whole lot better at sewing. Your photos are gorgeous and that colour! Thanks for sharing! 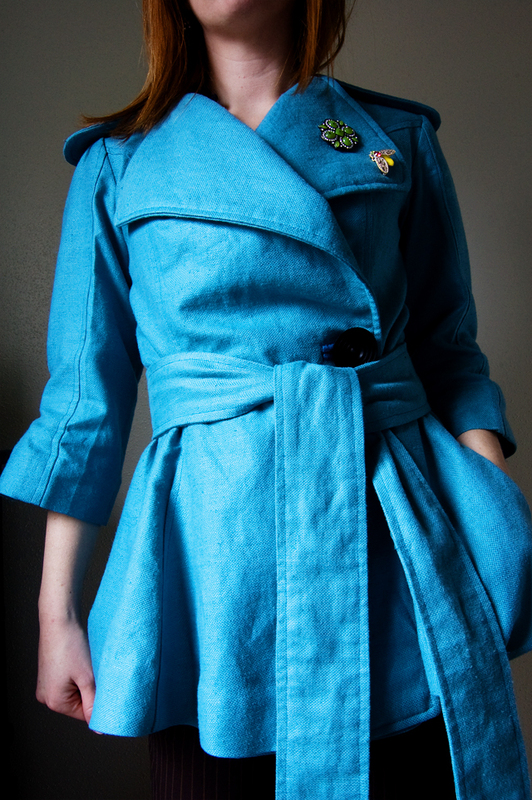 Beautiful coat and lovely review. 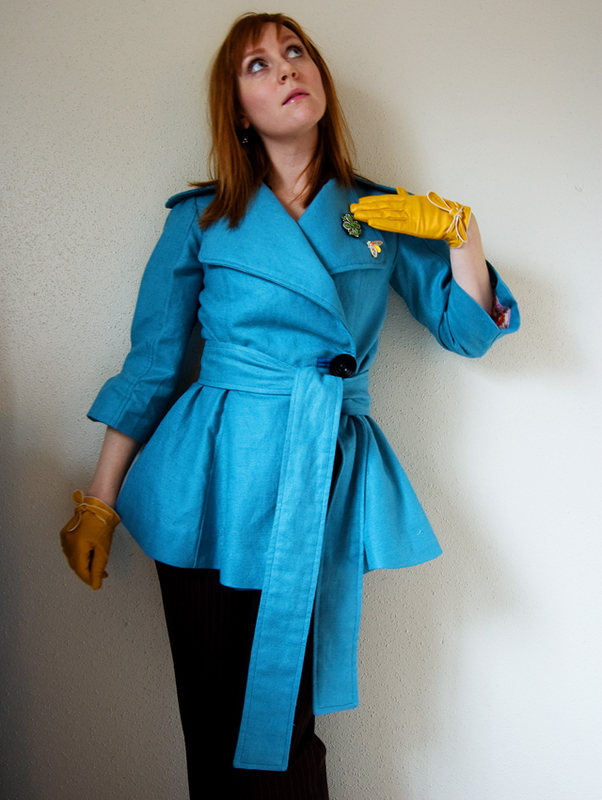 I have to say one more time, I really really love your version of this coat, and the color is smashing for you. Do I see some eye glittering? Cute! looks like it fits nice. the color is to die for, and i love the styling!